We do live in interesting times. In my opinion it has only taken around 6 years to go from a world dominated by broadcast and scheduled viewing to one where any type of media is available on-demand (OD) – well we are almost there. A new report from Insight Research with the catchy title “Streaming Media, IP TV, and Broadband Transport: Telecommunications Carriers and Entertainment Services 2006-2011” looks at the surge of demand for content in the next 5 years. 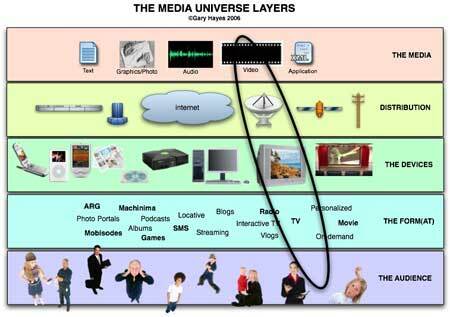 A world of media when, where and on what terms the audience wants it – they will be defining the business models and it is a lost cause trying to second guess the market, which makes many very nervous. Streaming media —the IP transmission of on-demand rich media that gives the user the ability to listen to audio and view video and graphics animation files from the network without downloading the content—is but one of several technologies being used to deliver information and entertainment services. IPTV, in the context of current broadband transmission technology, will make it possible to move beyond the multicast “time-shift” capabilities of cable’s video-on-demand models so as to deliver true interactivity to unicast, multicast, and broadcast audiences and give carriers a slice of the more than $250 billion forecasted to be spent each year on mass advertising. refers to the elimination of the middleman, i.e: the traditional content aggregator. When the industry achieves disintermediation, content creators no longer need to be big producers to get into the distribution channel. For example, a small Hollywood production outfit could distribute a movie directly to consumers using the Internet and local broadband access. The direct-to-consumer approach would allow content owners more control over distribution at a lower cost. Furthermore, consumers would have an unlimited number of choices. The new streaming media outlets have the potential to circumvent the traditional and restrictive distribution networks. It is undeniable that the trend is toward disintermediation—and streaming services offered through CDNs move the industry in that direction. It is uncertain how rapidly the rest of the industry will follow. OK pretty basic big picture and the same noises that have been made for the past two years at least. The key sentence though “it is uncertain…” in regard to the importance of the aggregator. I have presented and lectured on this point as to me this is the real tipping point – what importance will aggregators have in the future? Will incumbant portals and broadcast brands sustain their place in this democratised distribution market. Will search, niche interest portals, social networks and then personalisation become dominant or can mobile and the soon to be IPTV walled gardens keep their stranglehold on consumers. The easy answer is that both will exist in altered forms over the next few years. If anyone says they know the answer put your forefinger and thumb in the nearest salt pot.